This is my dining table at the moment. Envelopes, addressed and ready to go. 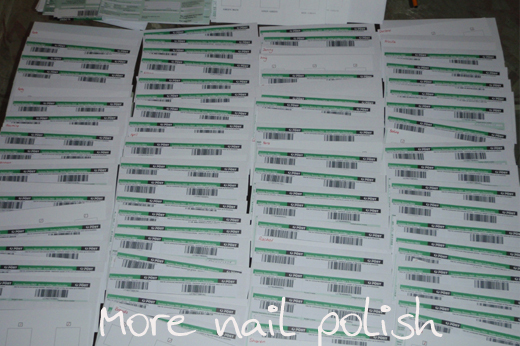 Those green stripes, they are Australia Post Customs Declarations, each one completed by hand!! And this is only about half of them. I am ready to go, I just need the powder. Unfortunately, emailing the supplier is a painful process because of time zones, I send them an email, they reply during their business hours which is while I'm sleeping. I wake up and reply straight away at about 7.00am, which is just as they are finishing work for the day. They read that email the next day and reply, which I don't get for 24 hours! The time zones are killing me! "I was under the impression you wanted all of them to ship together so no it has not shipped. I'm sorry I must have misunderstood. Do you still need these and the others you wanted? We have plenty in stock now. If you don't need them now I will refund the amount you already purchased. Sorry for all the confusion. " So now, I'm begging with you to continue being patient. I have received a few emails asking where their powder is and why I haven't emailed individuals yet with an update. I just have too many people to write to individually, it is far quicker for me to update you all here. Please don't email me asking if they powder has arrived. I promise I will post here as soon as it does and I'm not gonna run off with your money. Are we good? OK. It's a deal? Sweet. You are so sweet to do this for everyone! I so very much appreciate that you are doing this for us!! You are great for doing this and it looks like you are very organized! You poor thing! I did a huge custom order once and swore never to do it again!! That's a lot on your plate! Patiently waiting here:) Thanks so much for doing this! Thanks so much for doing this! I just want to be clear on the process - do we prepay somehow, or do we wait until you receive the powder? Thanks!! acidtrix - I'm taking payments for colour changing powder (but not yet for spectraflair). Send me and email with what you want and I'll let you know the process.